This blog was first published in May of this year. With some updates it appears here again as we wind down into autumn. Reposted: September 18, 2014. The process of overseeding is imperative to growing a healthy, strong lawn that covers your property with lush grass. 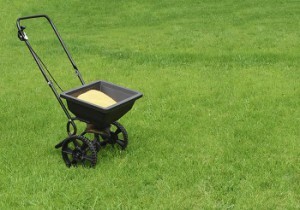 While fertilizing can go a long way to keeping your lawn healthy, after a few years grass plants slow their reproduction process. This gives weeds a better chance to grow and consume your lawn. Overseeding takes a little preparation, but with the right high-quality seed mix the results are well worth it. Here are steps you can take to make it a success. The first thing you have to consider is the time of year for your overseeding. September is generally viewed as the best time to start. Give the lawn a decent mow, but do not worry about getting it down to the root. It is not necessary to cut it super short for the seeds to take. Rake up all the grass clippings so the seeds can get into the soil, then loosen the soil using roto-tilling, aerating, or heavy raking.